One of the primary purposes of printmaking in the eighteenth century was copying paintings. Although they did not invent their own designs, printmakers such as Pierre-Alexandre Aveline developed innovative techniques to translate the visual effects of oil paint. 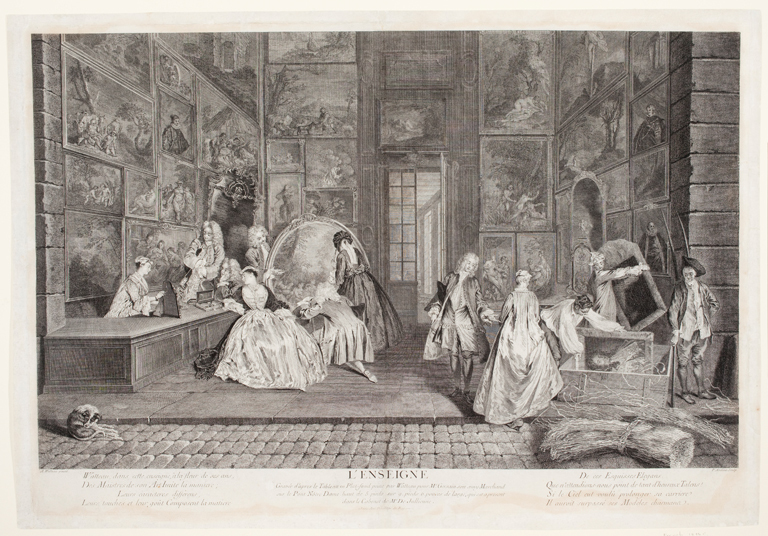 Here, using the fine point of his etching needle and engraver’s burin, he not only reduced the massive scale of Jean-Antoine Watteau’s original composition but also reproduced the light and the textures of glass, silk, wood, and hay captured in the painting. Exhibition label for "Daring Technique: Goya and the Art of Etching" on view in the Bradley Family Gallery, April 20–September 9, 2018. Winters, Laurie and Barry Wind. Escape to Eden: The Pastoral Vision in Eighteenth–Century France, Milwaukee, Wisconsin: Milwaukee Art Museum 1999, unpaginated, b/w illus. Daring Technique: Goya and the Art of Etching, Milwaukee Art Museum, April 20 – September 9, 2018. Escape to Eden: The Pastoral Vision in Eighteenth–Century France, Milwaukee Art Museum, March 19, 1999–May 30, 1999.